Hide this Project (KLP Utsav) Discover properties in other projects by hiding the ones that doesn't interest you. You won't see them in your searches further but you can unhide anytime later. KLP Utsav is a residential development in Jamalia, Chennai. The project is built by KLP Projects. They provide 1BHK, 2BHK and 3BHK apartment with all necessities. It is approved by Tamil Nadu RERA. What is the project location?The project is located at Perambur, Chennai North. What are sizes of apartments in KLP Utsav? The apartment sizes in the project range from 591.0 sqft to 657.0 sqft. What is size of 1 bhk in KLP Utsav? 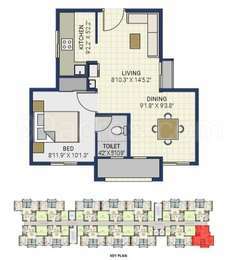 The area of 1 BHK apartments is 591.0 sqft. What is the area of 2 bhk in KLP Utsav? The size of a 2BHK unit in the project is 657.0 sqft. How much is price of 1bhk in KLP Utsav? The project offers 1 BHK units for Rs. 3800000. 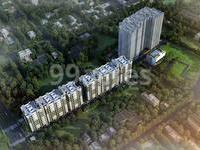 What is total price of 2 bhk in KLP Utsav? The price of 2 BHK units in the project ranges from Rs. 4400000 to Rs. 4450000. Pre engineered aluminum form-work technology RCC framed structure/partitions. Concrete and steel grade as per structural consultants design, as per design standards. The height of each floor shall be 2.97 Meter floor to floor. Staircases: steps shall be of RCC Smoot finish with MS hand rail and finished with enamel paint. Balconies/Open Terrace /Decks: antiskid ceramic tiles as per NBC norms, it is mandatory to not to have any grill/covering/shutters on balcony to comply the fire safety rescue norms. Interlock Pavers or Tiles or Grano flooring to be laid in drive-ways and walk-ways as per the architect design. Sanitary fittings : EWC floor mounted and wash basins will be provided. Faucets: Shall be double lever wall mixers wit hCP finish, heavy body metal fittings. Health faucet also shall be provided in all toilets. Door: Factory finished laminated doors with frame and shutter along with architrave. All the staircase shall be have two-hour fire rated doors from the lift lobby of each floor as per NBC Norms. Concealed copper wiring with modular plate switches, centralized cabling system for electrical and communication requirements. Wiring shall be done for lightings, 5Amps, 15 Amps and AC point in the apartment. Switches: All switches shall be standard make. The Generator point: Power back up will be provided for all common services and the electrical points inside the apartments with a maximum limit of [0.5 KW]| There will be limiter fixed in each apartment to control the same. Light fixtures for the common areas, external areas shall be provided. Provision for the one common GEYSER point shall be provided. Two coats of Oil bound distemper paint shall be applied in the common areas, utility, service areas and the ceiling of all the apartments. An eminent name in the real estate industry, KLP Projects aims to create exemplary living spaces through highest quality construction and meticulous finishes. It is backed by a team of experienced professionals who are very passionate about their work and customers. The company believes that buying a home is a big investment made by customers, not in just terms of money but also by efforts put by them. It is driven by the aim to set new benchmarks for design, construction and commitment through its exceptional projects.